SynergiaGSH’s ingredients simply speak for themselves, unparalleled quality and function, bought individually on the market today it would cost nearly three hundred dollars and consist of nearly two dozen pills. While some components seem more important than others, there is a measurable increase in their benefits when compounded together. If you are already a health conscious person you wont need any convincing past the ingredient list, this product is a home run. This is the most complete, highest quality immune supplement available. Acetyl-L-Carnitine is endogenously made, however it is normally far too low in concentration due to environmental contaminants and naturally decreasing with age. It is a key component in the production of cellular energy. Vital for the health of our heart, muscles and brain function. Used in the treatment of a plethora of disorders, from Dementia to AIDS, alcoholism to diabetes. A truly diverse and immensely important amino acid. 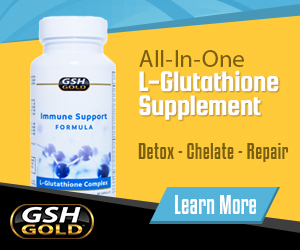 Acetyl-L-Glutathione is a master antioxidant endogenous to our cells. The acetyl form can be taken orally while the non-acetyl Glutathione is thought to be less bioavailable in oral supplement form. The most important factor in immune function, disease prevention, cell repair and maintenance and is the best indication of liver and overall health. Fighting everything from cancer to aging, it is the pinnacle of our immune health and cell life. Black Pepper 95% (Bioperine®) is another trademarked compound from Sabinsa. Essentially a piperine or black pepper extract, its primary function is to increase the bioavailability of other nutrients. Increasing your ability to absorb and use the nutrients, vitamins, amino acids and other beneficial ingredients of your supplement. An increase absorption of 30% when taken with CoQ10, this allows you to get the absolute maximum benefit of your supplement, making use of every ingredient to its fullest potential. CoQ10 (ubiquinol) is one of the best free radical hunters known to date. Powerful antioxidant and cellular energy production, this vitamin like substance is one of the most crucial to maintain. Converting food into energy and even playing a role in cellular respiration. Deficient levels of this substance have been linked to many immune disorders, crippling your body and leaving it vulnerable to disease and infection. Curcumin C3 95% Curcumoids is miles ahead of other curcumin extracts. C3 has three main chemical compounds, Curcumin, Demethoxycurcumin and Bisdemethoxycurcumin. Patented by the reputable Sabinsa, it is regarded as a “Super Antioxidant” providing the integrity and protection for our biological functions. Acting as an anti-inflammatory and pain reliever, this patented compound is attracting many health professionals and the basis for many health studies. Green Tea 90% Polyphenols are famous for their antioxidant properties. What might surprise you is the effects polyphenols have on our fat cells. Targeting fat cells for energy and even inhibiting their growth. While the bioavailability of green tea polyphenols is normally very limited, with the addition of Bioperine® we can absorb much higher amounts and benefit substantially health wise. Magnesium is required for healthy growth and maintenance of bones, as well as the function of nerves and muscles. A common deficiency in people who do not have a fiber rich diet, as it is found in fibrous foods. Magnesium is involved in over 300 chemical processes in our bodies, directly affecting our cardiovascular system and neurological system. Many people are deficient without knowing it, this can cause a decrease in energy and reduced stamina, constant tiredness and lack of focus. A vital supplement to maintain healthy bodily functions considering our diets often don’t meet required amounts of magnesium. Milk Thistle 80% Silymarin is extracted from the Milk Thistle and used as an antioxidant. It supports healthy liver function, bile production, processing of hormones in our bodies and protecting the liver tissue on a cellular level. Its powerful effect on the liver allows it to function properly and cleanse your body from toxins more efficiently. You will see results such as healthier skin, healthier stress response and healthier bowel function. N-Acetyl-L-Cysteine is an amino acid and the most important precursor to our bodies for glutathione production. Its powerful antioxidant abilities bind to toxins and chemicals in our liver and process them safely. It is used in the treatment of alcoholic liver damage, emphysema, cystic fibrosis, cancer, HIV and radiation damage. Phosphatidylserine 70% is made by our bodies, but we get most of our supply from the food we eat. Supplements are the best way to enhance your phosphatidylserine level, which is paramount for our brain and cognitive ability. Used in the treatment of Alzheimer’s disease, ADHD, depression and wards off neurodegeneration. Ample levels of this chemical increases our ability to think and reason, providing much clearer thought than someone with deficient levels. Iodine is a trace element found in fish and other marine food; not produced by our bodies but essential for our development. In 2007 the World Health Organization found that nearly 2 billion people worldwide were deficient, most frightening was that a large amount were of a young age. Iodine deficiency is the most preventable cause of cognitive stunting. Promoting healthy production of our thyroid hormones, it is crucial for healthy brain and physical development. R-Alpha-Lipoic Acid is another naturally occurring precursor to the production of glutathione. R-ALC deficiency is far too common however, making it essential to supplement your levels to increase glutathione levels. It is not only a powerful anti-oxidant, but a chelation agent as well, removing heavy metals from your body. Extremely effective in the treatment and prevention of neurodegenerative diseases in particular. S-Adenosyl Methionine or SAMe is made from Adenosine Triphosphate (ATP) and Methionine. Certain metabolic pathways like Transmethylation, Transsulfuration and Aminopropylation all use SAMe. While these processes occur throughout the body, the majority of SAMe is produced and used up in the liver. Numerous metabolic reactions require SAM-e to aid in the production and proliferation of nucleic acids, proteins and lipids. Seleno L-Methionine (Selenium) is found in our water and our food, and the amount needed by our bodies is quite small. Selenium does act as a powerful antioxidant in conjunction with other vitamins, namely vitamin E. Deficiencies occur when a person is suffering from immune debilitating diseases such as Crohn’s or HIV. Our high intake of processed food has caused Selenium deficiency to become more common. Vinpocetine is a semi-synthetic compound extracted from the periwinkle plant. Its effects include cerebral blood flow increase, neuroprotective benefits, as well as a powerful anti-inflammatory. Used in the treatment of many neurological disorders such as Alzheimer’s. supplementing Vinpocetine levels will enhance brain function, memory and reduce chronic pain caused by inflammation. Vitamin B2 (riboflavin) is found in many foods we eat everyday. It is constantly being used up and excreted through our urine though. It plays an important role in our cell health, maintaining cellular functions, ability to metabolize fats, carbohydrates and proteins. Vitamin B2 deficiency is extremely common and leads to a number of problems from inflammation, dry skin and lips, anemia and eye sensitivity. This is a very important vitamin to supplement on a daily basis. Vitamin B6 (Pyridoxal 5 phosphate) is essential in the process of converting the carbohydrates we eat into fuel for our cells. Healthy levels of this vitamin reduce the risks of heart disease, high cholesterol and anemia. This is just the tip of the iceberg though, as it is also an antioxidant and has been shown to help treat many neurodegenerative problems, cancer development, macular degeneration and a myriad of other health concerns. This amazing vitamin will actually help you remember your dreams, a sign that it has a powerful healing effect on the brain. Many people have trouble converting Folate into the biologically active form, 5-methyltetrahydrofolate (5-MTHF). This leaves a large portion of the population dangerously deficient levels of folate and higher than normal levels of homocysteine. By taking the biologically active form of Folate directly you can increase efficacy by up to 7 times. This is especially important for individuals with the extremely common genetic dysfunction known as MTHFR. L-Methylfolate is capable of crossing the blood brain barrier, improving cognitive health and function. Supplementing with methylcobalamin (B12), Vitamin B6 and Vitamin B2 the health benefits of L-Methylfolate are amplified. Vitamin B12 (methylcobalamin) is the most powerful form of vitamin B12, and it is crucial for red blood cell production and oxygen distribution on a cellular level. Mostly found in meat, it is only absorbed in our lower intestine. This leaves vegetarians and people with intestinal issues at risk of B12 methylcobalamin deficiency, and a study has shown up to 40% of the population is deficient in this essential vitamin. Leading to fatigue, dizziness, confusion, memory loss and diminished nervous system response and function. Vitamin C (Calcium Ascorbate) is easily the most commonly known vitamin. Used by our bodies to fortify our immune system and reduce our risks of many diseases. When supplemented in tandem with Acetyl-L-Glutathione it magnifies its benefits, retaining optimal vitamin C levels in the blood and recycling it naturally. Vitamin D3 USP should already be a front-runner in your supplement routine. Widely regarded as a crucial component in calcium absorption, recently this vitamin has been praised for its effects on diabetes, chronic pain, various cancers and general bone health. Vitamin D3’s most impressive benefit may be its ability to lower blood pressure, reducing the risk of cardiovascular disease and heart conditions. Vitamin E (Mixed Tocopherols) is an oil soluble vitamin found in certain meats, fruits, vegetables and eggs. It is used in the treatment and prevention of heart disease, high blood pressure and reduces the hardening of the arteries due to plaque build up and tissue disorders. Treatment of many diseases can benefit from the addition of vitamin E, nervous system disorders, cancers, menopause and even hot flashes. Vitamin K2 (MK-7) cannot be understated, this essential vitamin is crucial for the absorption and distribution of calcium. Calcium supplements harm us if not taken in conjunction with vitamin K2, depositing itself in the tissue and accumulating over time. Creating calcium deposits that can lead to stroke, heart disease and decreased vascular health. Vitamin K2 will latch onto the calcium molecules and bring it directly to where it is needed, increasing bone strength and reducing your risk of heart disease. If you are currently supplementing calcium you must also supplement vitamin K2 or you are at serious risk of complications due to calcification. Zinc Citrate is another element found in every cell, tissue and fluid in our bodies. Supplementing Zinc Citrate has shown positive effects with regards to our immune system function, improving skin and eye condition and has shown dramatic improvement in the behavior of those suffering from ADHD. All these ingredients hold amazing power on their own, when combined they are amplified and benefit us many times over. While supplementing each one of these ingredients is important, it is nearly impossible to source the highest qualities of each, not to mention it would be a hand full of pills to take on a daily basis. Now we come to the cost, if bought individually, these supplements would cost around 290$ on the conservative side. 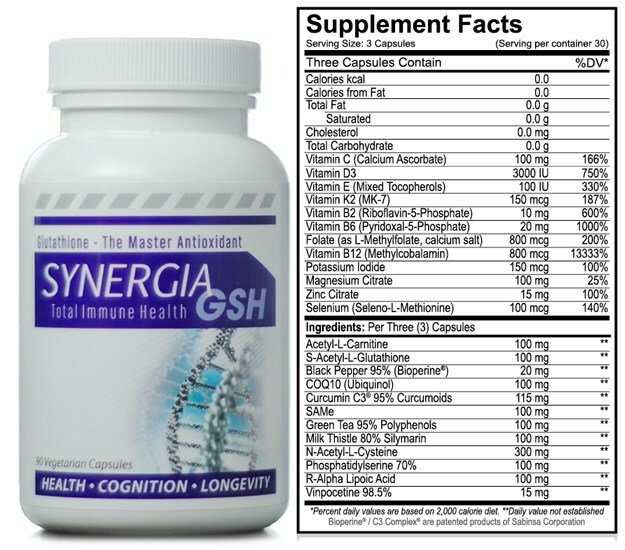 SynergiaGSH is a supplement that not only gives you the convenience of total immune health in 3 pills per day, but it uses only the highest grade ingredients and costs you a fraction of the price. Simply put, this is the most convenient, cost effective, and effective supplement on the market today.